What Does a Music Industry Record Producer Do? Record producers work with bands, session musicians, and the studio engineers to "produce" the sound of the recordings. A producer's job often involves providing an extra set of ears to aid in the creation of a certain sound or to provide the perspective that comes with experience. In modern recording studios, this doesn't necessarily mean the creation of a vinyl record as it once did, but the name has stuck. Record producers may be involved with arranging parts of a track or even writing them. In smaller studios, the roles of engineer and producer may be combined, and bands may produce or co-produce the recordings with an engineer. The roles of record producers can vary greatly depending on the project and the relationship to the musicians doing the recording. All record producers need the technical skill to record, mix, and master music, and some do little more than this if the musicians are driving the creative process. However, some producers play a significant role in the creative process and helping form a musician’s or a band’s sound and tone. Regardless of the extent of the role producers play, they are expected to be experts at helping musicians achieve the sounds they are seeking. Most producers are paid a flat fee or an advance for their work. Some also receive points, which are a percentage of the dealer price of a record, and/or a share of the profits made from the recordings. It's common for producers to receive both. Producers may work for a reduced up-front fee in exchange for some points or may secure a fee plus points if they feel their production will be important to the record's success. Producers involved in the songwriting process can expect royalties on top of production fees. As with all aspects of the music industry, contracts are important because they let everyone know where they stand and what is expected of them. Bands may expect producers to oversee recording, mixing, and mastering, but a producer may be expecting to work only on the recordings. These issues, along with fees and points, are more easily discussed before recording begins, and a contract can clear up any misunderstandings. Producers might begin work as engineers in studios, as session musicians, or both. As technology has improved in recent years, it has become possible for people to gain experience using recording and mixing software available for their home computers. Education: Producers ideally should have some background in music, whether it comes from formal education or not. Additionally, they need to master the technical skills associated with being a sound engineer. These skills are often taught in associate degree programs. Training: Sound engineering and ultimately producing are hands-on skills. Even in associate degree programs, students will likely be expected to get firsthand experience working with sound and mixing. Technical know-how: Even though producers may be working with sound engineers, it’s important that they be proficient with the sound equipment themselves. Creativity: The musicians might be the creative forces behind a recording, but they need input and feedback from their producer. Additionally, when musicians have an idea but they don’t know how to execute it, the producer is often the one to come up with a way to create and capture that sound. Communication skills: Producers need to understand what musicians are trying to accomplish, and they also need to be able to communicate to musicians what they think will sound best based on all circumstances. Conflict resolution: With multiple musicians, a producer, a sound engineer, and perhaps others all collaborating on a recording, there often will be disagreements. Producers need to know how to use their expertise and their people skills to come to an agreement on the best option. The U.S. Bureau of Labor Statistics does not track record producers specifically, but job growth for sound engineers is projected at 8 percent for the decade ending in 2026. This is slightly better than the 7 percent job growth projected for all careers. Job growth for producers and directors in entertainment and sports, which also encompasses film, television, and theater, is projected at 12 percent. Work environments depend on the type of work a producer is doing. In-house producers work for specific studios where musicians might rent time. Along with that time, the cost of renting a producer might be included. Studios often like to retain in-demand producers as in-house producers because it increases the likelihood of musicians wanting to rent their studios. However, the more in-demand a producer is, the more likely it is that person will operate as an independent producer. Independent producers are employed by bands or by record labels on a band's behalf. Usually, this is an established producer who has a good professional reputation and is someone who bands seek out. This kind of producer's fees will be separate from studio rental fees. 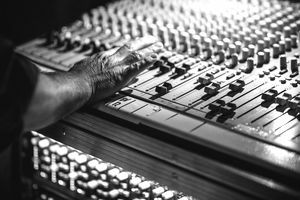 Regardless of whether a producer is working in-house or independently, collaborative relationships with musicians and sound engineers is an important part of the job. There is no fixed schedule for being a record producer. In-house producers are more likely to have a regular schedule, but depending on the demand for and availability of studio time, hours might still involve weekends and evenings. Independent producers working for a specific musician or band might have their schedules dictated by when the band likes to or is available to record. Being a music producer requires a love of recorded music. Learn how to use mixing equipment through a formal or informal program. Build a reputation for being a producer whom musicians seek out.